Request More Information on Ohio Medicaid Coverage. The Ohio Medicaid program, hand-in-hand with the Healthy Start program for kids, provides free and low-cost health insurance for Ohio residents in need. The program includes 130,000 providers and 2.9 million beneficiaries. Beneficiaries have a few plan options to choose from and a lot to learn about before enrolling. This guide will help you get started! Special note to those who also qualify for Medicare (under 65 or with a qualifying disability): Medicare Plan Finder offers “dual” Medicare Advantage plans for those who are eligible for both Medicare and Medicaid. Incentives like a $25 reward for getting your flu vaccine, $35 for well visits, etc. Incentives like $150 for well-baby visits, $130 for women’s health exams, etc. Access to health and wellness programs like weight management, high-risk pregnancy help, etc. Incentives like up to $225 for pregnancy care, $100 for diabetes care, etc. Access to health and wellness programs like smoking cessation, health needs screenings, etc. Incentives like $125 for purchasing baby gear, healthy well visit rewards, etc. Access to health and wellness programs like “Baby Blocks,” disease management programs, etc. Incentives like $50 for breast cancer screenings, $25 for wild child visits (ages 3-6), etc. The benefits listed below are largely the same regardless of which plan you enroll in. Other benefits may be possible and this list is subject to change. Most preventative healthcare services do not have a copay, including wellness visits, family planning/pregnancy care, physical therapy, inpatient and outpatient hospital visits, medical equipment, x-rays, immunizations, and other exams and screenings. If you visit the emergency room with a medical necessity, you will not face a copay. However, if you visit the emergency room and it is determined that your medical need is not an emergency, you may face a $3 copay. For optometrist and ophthalmologist services, you will be charged a $2 copay for exams and a $1 copay for eyeglasses. Contact lenses can only be provided with prior authorizations. Those under 21 and older than 60 will have access to one exam and one pair of eyeglasses every year, while those between the ages of 21 and 59 will have access to one exam and one pair of glasses every two years. Glaucoma screenings are included. The dental portion of the program includes coverage for checkups and cleanings, braces, dentures, fillings, extractions, crowns, surgeries, and root canals. Some of these services are only offered for kids. There is no copay for ambulance and ambulette transportation for medical emergencies. Some beneficiaries may also be eligible for non-emergency medical transportation. In this case, there is usually a limit of 30 one-way trips per year, and those trips must be getting you to another covered service, like a doctor’s appointment. All Medicaid beneficiaries will have access to prescription drug coverage, but those who are also eligible for Medicare will have to select a Medicare Part D plan or a Medicare Advantage plan with prescription coverage and will not receive prescription coverage through Medicaid. If you get your prescription coverage from Medicaid, you won’t have a copay for drugs relating to hospice, emergency services, and family planning, but most other brand-name drugs will require a $2 copay. You will pay a $3 copay for drugs that require prior authorization from Medicaid. In most cases, drugs for acute conditions can only be supplied for as much as 34 days at a time, and those for chronic conditions can be dispensed for up to a 120 day supply. If you are a United States citizen or lawful permanent United States resident who has a primary residence in Ohio and has a social security number, you can be eligible for Medicaid as long as you meet the income requirements. Healthy Start, sometimes called “OCHIP,” for the Ohio Children’s Health Insurance Program, is a Medicaid program for those who are under 21 or pregnant and meet the income requirements. This program covers mostly the same items as the Medicaid program for adults. The main difference is how you can qualify. 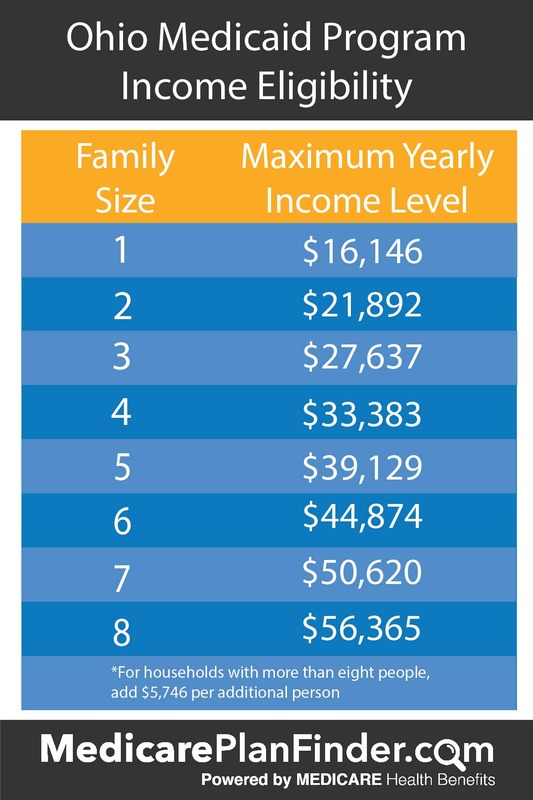 In some cases, kids may qualify based on household income even if adults don’t. When you apply for Ohio Medical Assistance, you’ll be able to apply for Medicaid, cash assistance, food assistance, and child care assistance at the same time. You can download the Ohio Medicaid Application PDF, print and complete it, and then mail it to your county Department of Job and Family Services office. You can also apply for benefits online, here. You’ll have to create an account to proceed. If you qualify for both Medicare and Medicaid in Ohio, you can be getting DOUBLE the amount of benefits that you would if you had only Medicaid. For example, you may be able to get double the amount of non-emergency medical transportation, added benefits like more over-the-counter drugs, access to gym memberships and programs like SilverSneakers, a potentially larger provider network, and more. To speak to someone about making sure that you are getting the most out of the benefits that you are eligible for, send us a message or give us a call at 833-438-3676.